Built in 1966, the Pellant Road Estate today lacks positive character or a sense of community ownership. When Allen Scott was brought in partway through the process, it realised that the purely cosmetic changes that had been proposed would have little impact. Instead it proposed more radical changes, which it presented as a set of clearly explained strategies, in order to convince the client and residents. These include demolishing a large proportion of the existing concrete podium and the warren of underground garages that currently encourage and enable crime and anti-social behaviour. The spoil from this demolition would backfill the ball court area that is currently inaccessible and breeds anti-social behaviour. It will be transformed into a space that’s safe, visible and exciting. The demolished garages will be replaced with SuDS (sustainable drainage solutions) paving, vegetated swales and safely lit car parking spaces. 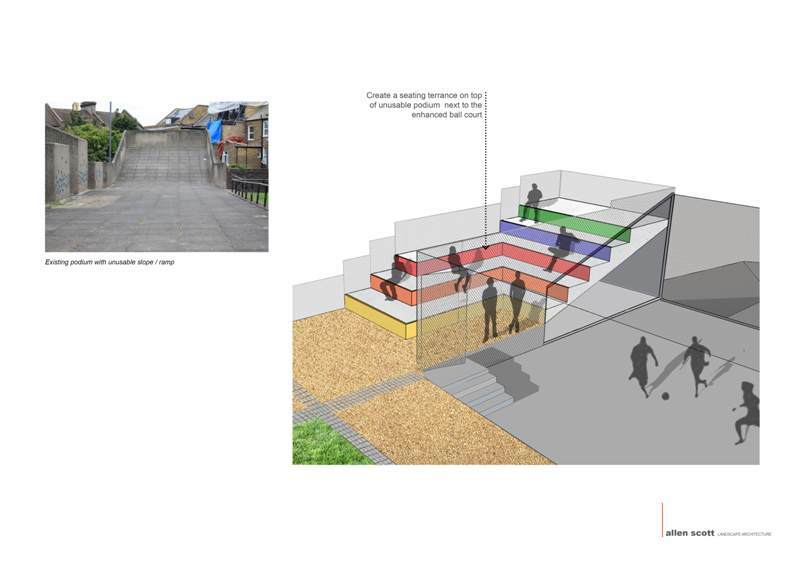 The original brief was to prepare landscape enhancement proposals from concept design through to detailed design in association with building enhancements by GDS Building Surveyors. 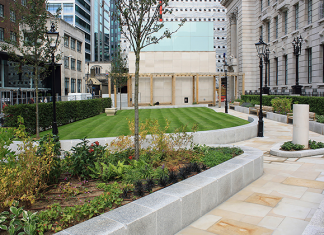 Allen Scott Ltd was brought into the project team by GDS Building Surveyors to work in collaboration and lead the Landscape Architecture from Concept Design through to Detailed Design. We started this role with undertaking a comprehensive analysis of the site, the project history and trying to unpick the project vision and aspirations of the residents and Council. We were able to talk directly to some of the residents and had very useful early discussions with the resident association. We gained a better understanding of the estate and its social, environmental and economic issues. We soon realised that the earlier landscape concept designs prepared by others and our brief was not ambitious enough to tackle some of the real issues that faced the residents and wider community. Based on our site analysis, research and resident engagement we were able to challenge our original brief and the landscape budget and prepare some options and ideas to define what the concept plan might address. We worked closely with GDS and Mitie to develop and test some early ideas around making fundamental (and faily bold) changes to the current built environment of the estate. We also worked closely with the ecologists and the BREEAM assessors on the project who helped us shape the concept design proposals. Our role shifted from a simple sub consultant preparing a landscape plan to a ‘champion’ for making significant change to the 1960s architecture which, in many peoples opinion, fails it’s current and future community. The outcome from our concept design report influenced a decision to omit and defer the proposed cosmetic improvement to Chasemore House and Donnerly Court buildings and focus more of the budget to deliver our recommendations. Our concept ideas changed the nature of what is being submitted for planning approval.